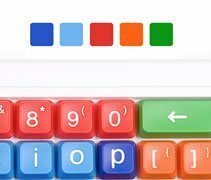 The Clevy Keyboard is an attractively designed keyboard, designed to help teach writing and keyboard skills to young children. Its design also makes the Clevy Keyboard very suitable for keyboard users with a wide array of special needs. The font in which the characters are printed onto the Clevy Keyboard’s keys is similar to the font used in traditional education of hand-writing, which makes keys immediately identifiable. The keys of the Clevy Keyboard are 30% bigger and the characters on them even up to 4 times bigger than those on an average keyboard, making them simpler to find and easier to hit. 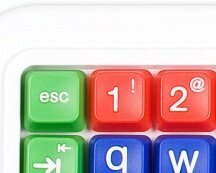 The differently coloured keys cleverly represent the different functional areas and make the keyboard fun for children to work with. The keys are arranged vertically to improve positioning of the hands and to make the appearance less cluttered. Unnecessary, distracting keys are left out. 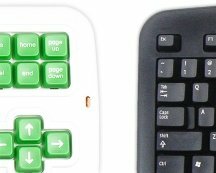 Clevy keyboards have internal steel frames and each individual key is mounted onto a high-quality, mechanical switch capable of handling well over 50 million keystrokes. 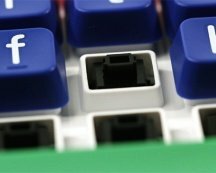 Most keyboards on the market use membrane-type internal switches, which are far less durable and consistent. The keyboard’s housing is designed to guide possible spilled fluids straight through the keyboard, keeping these liquids away from the internal electronics. 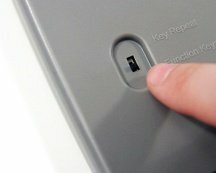 Key repeat can be switched off with an on-board switch, causing a letter to appear on the screen only once no matter how long a key is pressed. This same switch also enables the use of function keys by pressing the letter “f” and the respective number (eg. f+1=F1). 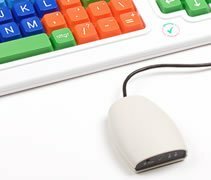 The Clevy Keyboard is also available in a Bluetooth version and a wireless version as part of the Simply Works range, the World’s first fully integrated wireless system specifically for users with motor skills difficulties.